Google Chrome, Firefox, Internet Exlporer, Safari… WHICH INTERNET BROWSER DO I USE?! Unless you spend a lot of time reading the specifications and hard details of internet browsers, you probably don’t know what half of internet browser reviewers are talking about. When I read that Google Chrome uses the latest NVIDIA 8600 Graphics Unit, my head starts to explode a little. And the fact that Mozilla Firefox has 1 GB of RAM and a 1200x Processesing Core means nothing to me. What I would like to read is a user account of the performances by each of the major internet browsers. Well, lucky for you, that’s exactly what this is. So sit down and buckle up because this is my first forray into technological smartness stuff, and it’s sure to get ugly along the way. 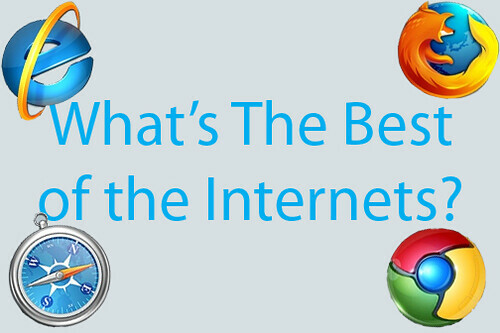 Which is the best internet browser; Internet Explorer, Google Chrome, Mozilla Firefox, or Apple Safari? You know, the only positive thing I can come up with is that Internet Explorer has great support. Probably the best of all of the browsers I used. However, 99% of people have never and will never use or care about Costumer Service and Support for their internet browser. So this is pretty much useless. I used IE 8 when it first came out, and as with all Internet Explorers, I was unimpressed. Right out of the box it was one of the slower browsers. When you begin to download toolbars, however, it gets really ugly. I was operating an election 2008 toolbar and a StumbleUpon Toolbar on each browser that had support for those applications and Internet Explorer took the add ons the worst. Pair that with the fact that as I type this the only browser that isn’t working of the four I have downloaded is Internet Explorer (It’s telling me I’m offline. Clearly that’s not the case. ), and it’s obvious that it’s the weakest of the bunch. For slow loading and start times, not to mention poor stability, I give IE 8 2 of 5 stars. Mozilla definitely pulled out all the stops with their Firefox browser’s third version. The newest version features better privacy features, quicker performance, and, coolest of all, new applications. The best thing to be said about Firefox is it’s vast expanse of applications. Like the iPhone, I can assure you “there’s an app for that”. Whether it be a theme or a weather widget, the mozilla.com has it all. Thankfully, Firefox can handle the extra applications. I’ve installed over 20 applications, and website loading time hasn’t been drastically increased. However, I’ve been experiencing some stability problems with the latest update to Firefox. The browser often crashes and leaves me having to restart and try and remember all of the tabs I have open since it doesn’t save your tabs by default. Definitely an inconvenience, but not a deal breaker. For the vast array of applications, Firefox still gets 3.5 of 5 stars. When Apple announced the release of the Safari browser to Windows-based computers, I was pumped. I’d heard all my Mac friends talk about how zippy Safari was for years, so of course I needed to be a part. Unfortunately, like most things, Safari must work best in its home environment because I was not all that impressed. Though Safari has the second best start-up time, it’s all a big scam. Once the window starts up the browser stalls for 3 to 4 seconds then loads. Though Safari was the second most stable browser in my tests, the 3 to 4 second delay between page loads is extremely annoying. When you’re running several tabs, that adds many minutes on to your browsing experience. And quite frankly, Safari doesn’t have the extra features to justify the slow performance. For that I give it 2.5 of 5 Stars. Ahhh Google, you amaze me. As if Google wasn’t cool enough already, they release a killer internet browser that blew the competition out of the water. Once I finally got around to downloading Chrome, I found that it was what I’d always looked for in an internet browser. The window pops up immediately after clicking the icon, and the home page loads quickly after. It amazes how Chrome manages to open and load so much faster than the other browsers when they are all operating on the same wireless network. Each time I click a link or load a page, I’m amazed by the speed of Chrome. I’m so amazed, in fact, that nearly every time I get the chance I tell my friends and colleagues to download Chrome. It’s allowed me to be so much productive when on the internet because it doesn’t have the unstableness of Fireforx, the stalling of Safari, or the generally crapiness of Internet Explorer. For being far superior to anything I’ve ever seen, I give a perfect score of 5 out of 5 Stars. Which of the browsers do you use most often? Leave your own experiences with internet browsers below or send an e-mail to theconservativejournal@gmail.com. Don’t forget to bookmark The Conservative Journal and sign up for the RSS Feed and the daily e-mail newsletter. Also, be sure and use the new rating feature, found at the bottom of comments and posts! Top 10 Best/Worst Music Videos of 2009: Vote Now! Click here to visit The Conservative Journal on Facebook! The Conservative Journal has been nominated for four Blogger's Choice Awards! Click the icons to vote for the site! skosstas on Swine Flu: Never Fear, You Can Still Eat Bacon! Steve Mittelstadt on Pointless Post of the Day: Top 10 Largest Public and Private Universities in the U.S. The Conservative Journal · – Conservative Politics, News, Opinion, and Entertainment All in One Place!